Over Winter Break we rearranged the JCHS Library. I mean....really rearranged the library. The only things that were not moved are literally bolted to the floor or walls. Thus, when we were getting ready for the second semester 9th Grade Library Orientation I realized the entire lesson plan had to be scrapped as well. 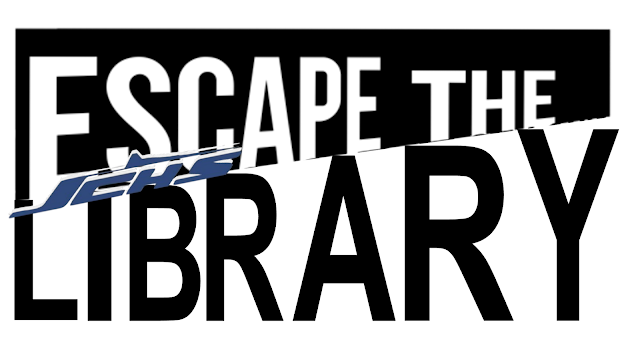 Inspired by Breakout EDU games created by librarians, Melanie Thompson (Locked In the Library), Amy Williams (Breakout From Mr. Lemoncello's Library), Amy Woods (The Discoveries of @2LibraryGals), Joseph Jeffery (Library Treasure), and Mia Beesley (Library Interview Breakout), I spend this past weekend revamping the library orientation lesson plan to model a Breakout EDU challenge! It's not the best and could definitely use some tweaking but it was still a tremendous amount of fun! My main goal for the Library Orientation activity was to make sure students knew about some of the unique features the JCHS Library has available for students. 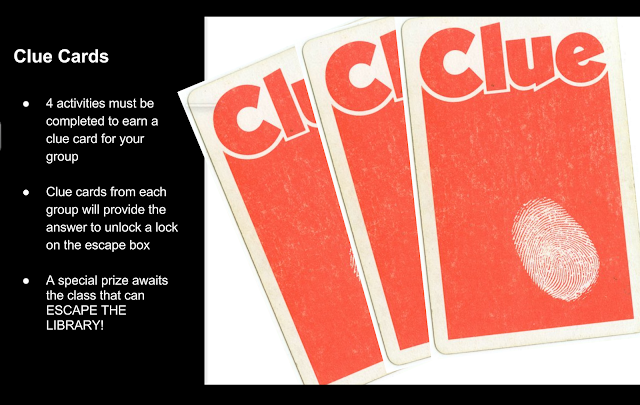 Because we only had a little over an hour to introduce the game, complete the tasks to earn clue cards, and unlock the locks, I limited the game to just four tasks. We began the orientation in the Harvard Room where Ms. Laura Smith introduced students to the ebooks and audiobooks we have available through the JCHS Library. Then I reviewed the rules of the game (see slideshow HERE). Teams then transitioned into the library with their direction sheets and the real fun began! 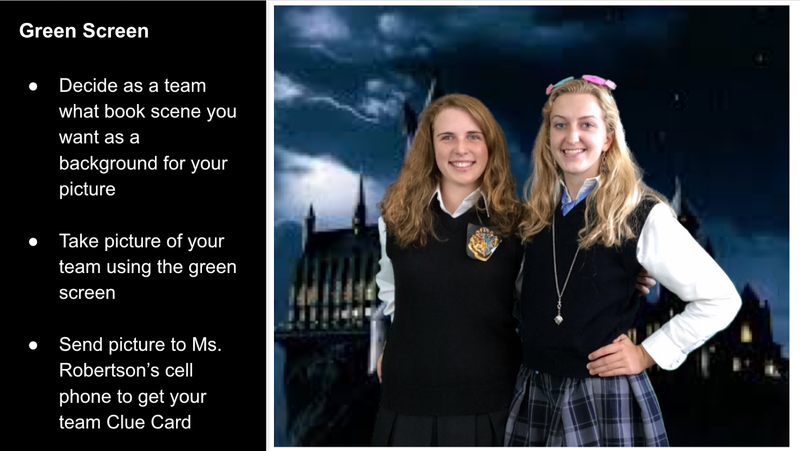 My awesome Student Library Aides helped with the game by overseeing the Green Screen Room and the MakerSpace. 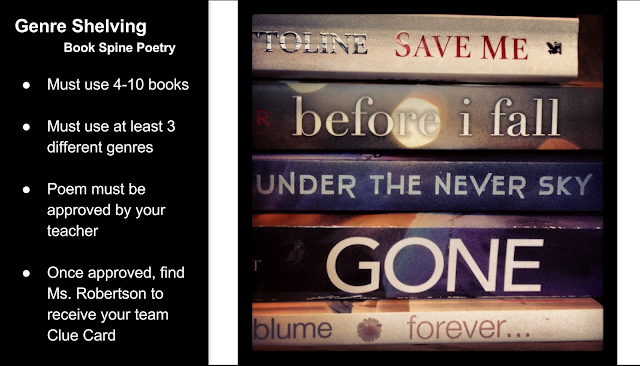 The classroom teacher was put in charge of approving the Book Spine Poetry. My wonderful library aide, Holly O'Neal headed assisted students tackling the Personal Shopper task. Once all teams had collected their four clue cards we meet back in the Harvard Room. Once back in the Harvard Room students were regrouped into four groups that represented the four tasks completed. Clue cards earned by all teams had to be put together to find the lock combinations. Once the new teams thought they had a lock combination they came to the Breakout EDU box and tried their luck. When all four locks were removed I had a Post It note inside the box saying CONGRATS! LOL! Students were NOT happy when they saw the note after all their hard work. Luckily I pulled out a box of Tootsie Pops from my hiding place just at that moment. The best part of the day was when a student said, "I was having a really bad day today until I came in here. Now my day is awesome!" 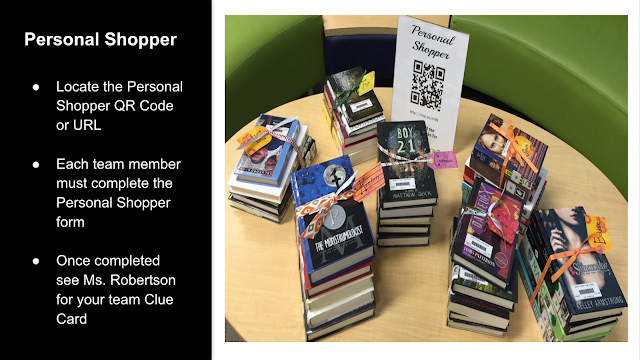 Our next big task is taking the Personal Shopper responses and matching each student to 3-5 books that best suit them based on their Personal Shopper answers. Below are some images of the directions students received. I have also included my Google Slide Show and link to my Google Photo album from the day. The lesson plan can be found HERE. 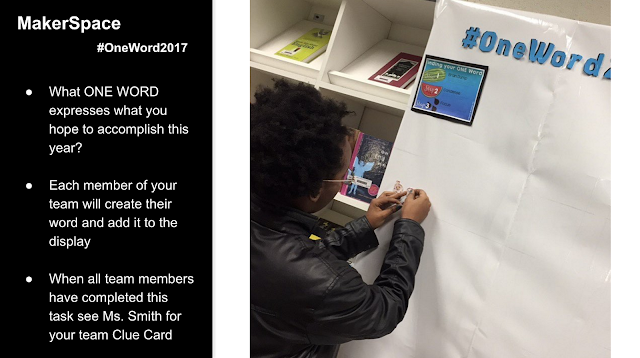 Clue cards and student instructions can be found HERE (Clue Cards were printed on bright colored paper for easy regrouping at the end). I love this! Can you tell me how many groups you had in your classes? Just trying to figure out how to do this (in a modified version). Did you use every clue card or give some groups more than one clue card? I see you have a lot of clue cards and wonder if you had that many groups but only 4 stations for students to go to. Trying to avoid overcrowding at the stations.